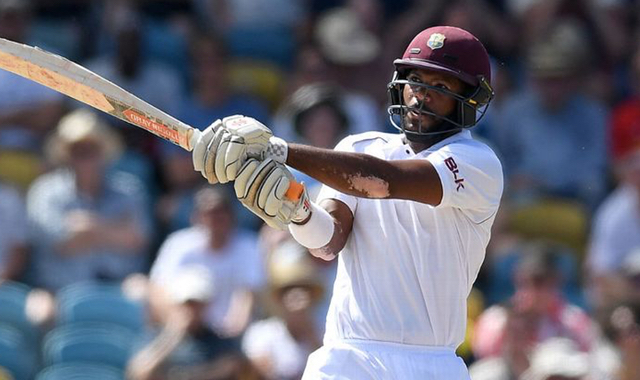 An impressive debut by opening batsman John Campbell and the looming threat of Kraigg Brathwaite marked a strong start for West Indies on the first day of the first Test against England in Barbados. England’s selection of a twin spin attack with Moeen Ali and Adil Rashid, in contrast to the home side’s decision to opt for four fast bowlers, bore fruit with Ali claiming the only wicket of the session – that of Campbell – shortly after his introduction. Having been presented with his cap by Garfield Sobers, 25-year-old left-hander Campbell settled in nervelessly after West Indies won the toss and elected to bat, while vastly more experienced partner Brathwaite’s role was reduced not to a cameo, but that of an extra. Campbell scored a four off Sam Curran with the first ball he faced in Test cricket and he found the boundary rope again with the last ball of the over, the second of the match. England’s decision to play two spinners, in contrast to the home side opting for just one, was initially put to the test when Moeen made his entrance after 16 overs, serving up a full toss and then watching Campbell deftly sweep his second delivery for four through midwicket. However, Campbell’s rush of blood proved his downfall when he attempted to sweep the first ball of Ali’s next over and was hit flush on the back leg for lbw, the debutant starting to walk off immediately before Brathwaite called him back to check he did not wish to consult the DRS, which would not have saved him. Moeen and Rashid were selected as England’s two spinners for a pitch captain Joe Root admitted he would have batted first on too, had he won the toss. Their selection meant the omission of Stuart Broad, despite the resurgent quick bowling impressively during the warm-ups. Broad was edged out by Curran with Root saying he made a “gut call” on the basis of the latter’s batting strength. The West Indies opted for just one spinner, Roston Chase, in addition to four quick bowlers. West Indies captain Jason Holder said, “it’s a pretty good wicket,” and reiterated his call for his batsmen to step up and, on the strength of the first session alone, it appeared they had heeded his message.